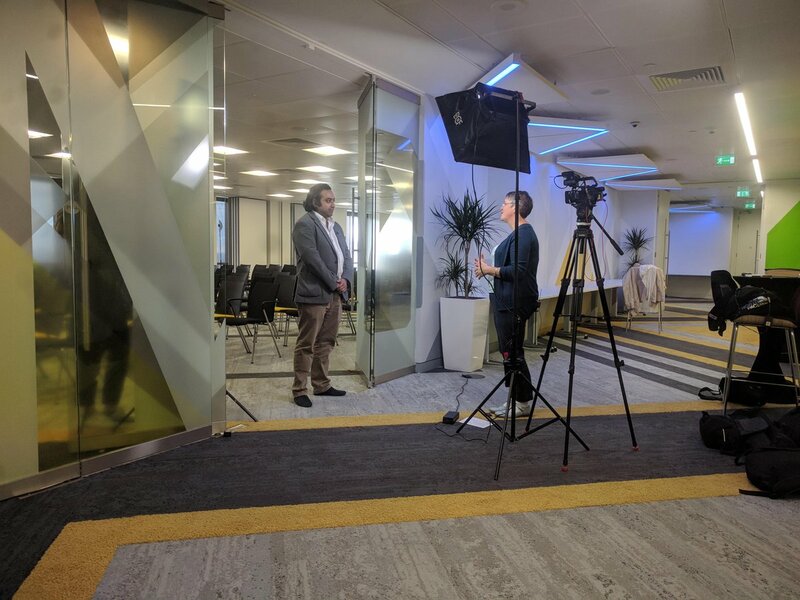 Following on from our post Bitcoin – Reader Beware let’s take a look at some of the considerations when looking at Bitcoin and other cryptocurrencies when your motivation is investing for profit. The two most regular topics of conversation that I see being discussed are: 1) Is this just a bubble and 2) Is Bitcoin a Ponzi scheme? 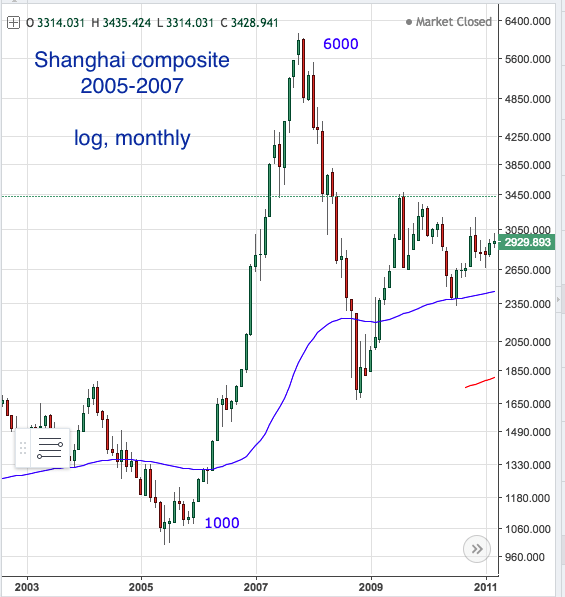 Jon Cotton addresses the first question in this article by comparing the recent parabolic move with some famous bubbles from history. Is Bitcoin the biggest market bubble in history, or is it just getting going? 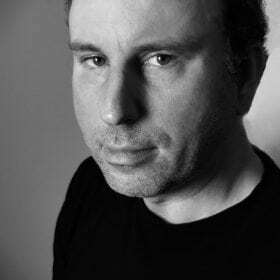 Casual comparisons between the crypto market and the dotcom bubble have been rife of late. I decided to take a look at the two periods to see how the charts compare. Nasdaq, 9 years, monthly (log view). A parabolic rise is one where the value of an asset rises at an exponential – and ultimately unsustainable rate. An example was the Nasdaq 100 index during the dotcom bubble. A stockmarket “ascending channel” charting price over time would normally take place between two upward sloping parallel lines. 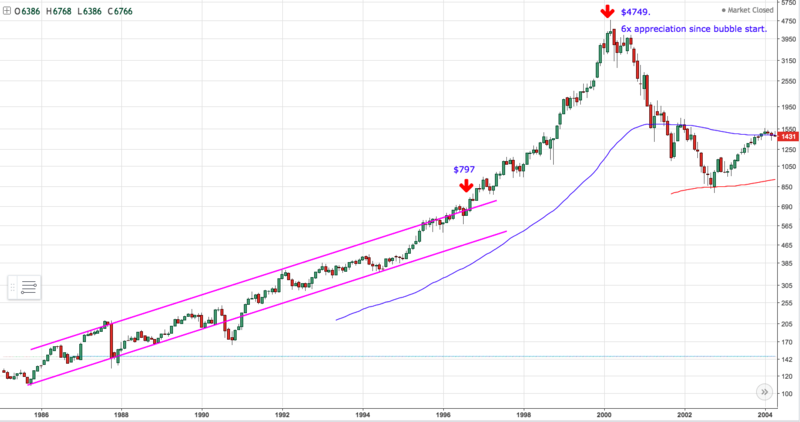 Once the Nasdaq broke out of its ascending channel range in 1996 it increased 6 fold in 4 years, before crashing to earth in March 2000. Using similar scales on X and Y axis, here’s the BTCUSD chart. Now some of you may be saying ‘hang on, BTC isn’t an index like the Nasdaq. It’s true I’m using it as a proxy for the whole Crypto space, since it tends to lead sentiment in the same way the Nasdaq did with tech stocks. So, just to be sure let’s check how the entire space looks shall we? Note that in order to fit exponential growth onto a single page, all of these charts are log charts – where the y axis markings show multiples rather than linear values. 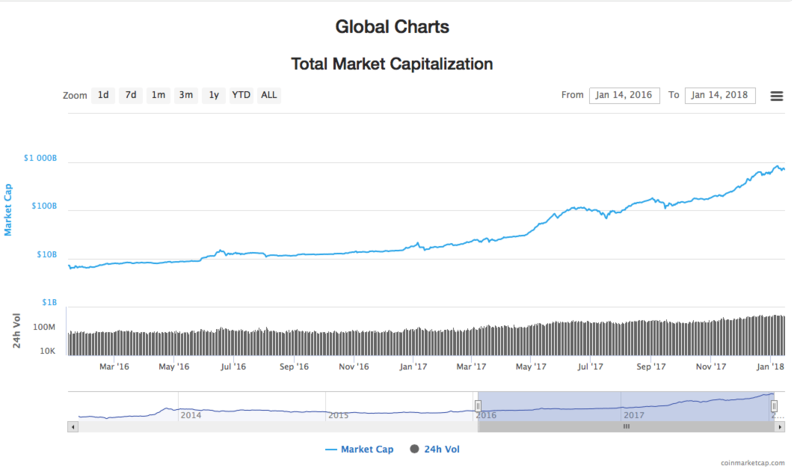 Market cap at the December 2018 market peak: $828 billion. This represents a 116 x appreciation in the same two years. So if dotcom is a poor comparison, what else are these giant BTC/Crypto moves comparable with? Let’s take a look at some other famous parabolic moves. In which Chinese housewives were famously trading from home. In which a company was granted a monopoly on trading with South America. 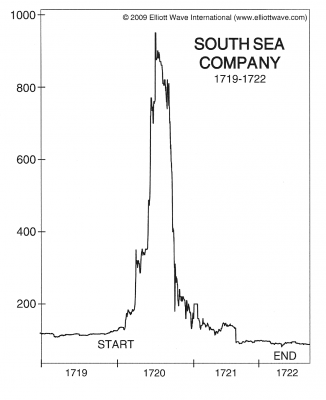 The ensuing bubble decimated the British economy in the 1700s, wiping out among others Sir Isaac Newton’s life savings. “I can calculate the movement of stars, but not the madness of men.” – Newton. And of course, no bubble comparison would be complete without tulips. 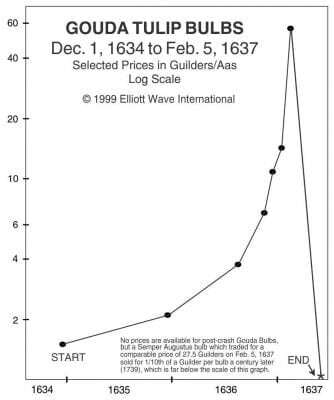 So by those measures, the crypto market is the single biggest/fastest market bubble in history – with Bitcoin (BTC) itself equaling the tulip move almost exactly. Market cap. At the peak of the dotcom bubble the Nasdaq had a market cap of $6.6 trillion (source: Reuters). All the gold ever mined adds up to around $7.8 trillion. As all cryptos added together currently have a market cap of $700 billion, or around the size of Microsoft then there is still much room for further growth within the crypto market. These are currencies/stores of value rather than companies. As such, are they really comparable? Cryptocurrency has greater utility and is easier to send than a tulip..
I’m not here to pass judgement, I will however leave you with one final comparison as food for thought. These both use linear y-axis, so look rather scarier than the previous log charts. Cryptocurrencies are clearly part of the future, just be careful you don’t get run over en-route. This entry was posted in Bitcoin, Education, Research and tagged alt coins, bitcoin, bubble, crypto, Crypto Currency, TA, technical analysis. Hi Jon, thanks for the interesting article. I am concerned that we are not comparing two identical things, on one hand BTCUSD is an unregulated currency market where NASDAQ is a regulated equity market. Sure the charts look similar but the underlying fundamentals are so much different aren’t they? The only thing these markets seem to share is they both have volatility and event risk. As such it’s hard to draw probabilistic correlations here. Problem is the fractal nature of these things, where we have self-similar repeating chart patterns stacked within and on top of each other. 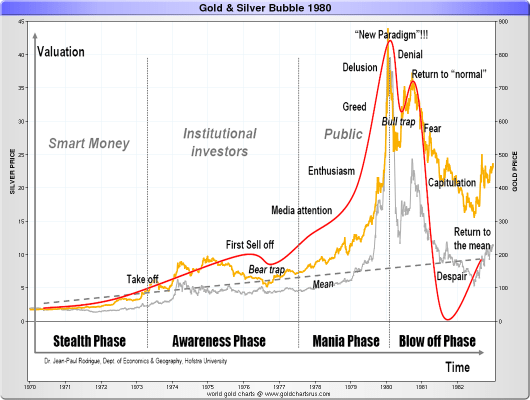 Your bubble overlay fits great on the entire history, but zoom in on the smaller bubbles, the 2013 bubble for instance and you’ll see it fits there too. 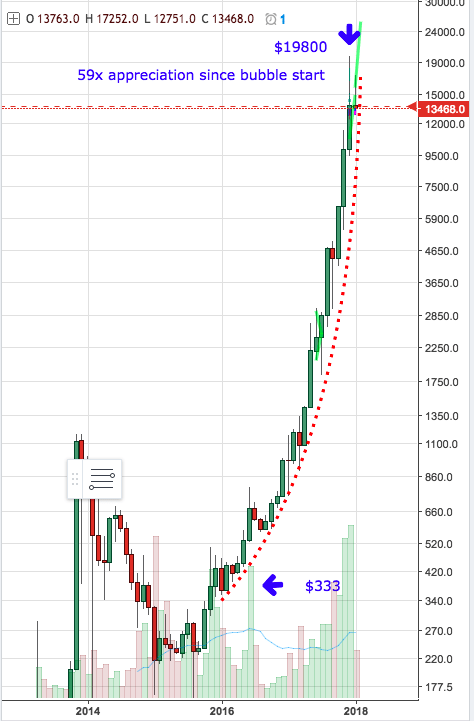 BTC grows in such cycles so this pattern repeats itself a lot! None of us are in a position to say where this ends I’m afraid.